WW1 Reenactments Equipment : Great War Tommy WW1 Food Rations Labels : Armours Pork & Beans, 1898 -1914. WW1 Reproductions and WW1 Reenactors Equipment / Kit - Armours Pork & Beans, 1898 -1914. Armour's Pork & Beans, 1898 -1914. 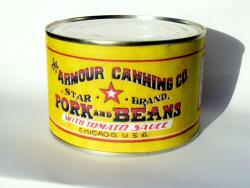 'Star' brand Pork & Beans label, to suit 7cm x 10cm dia' cans, by the Armour Canning Co of Chicago, USA. Ideal for Spanish-American War, Anglo-Boer war, Boxer Rising, Ashanti Campaign, etc, and early WW1. This was an early 'key' opened can.